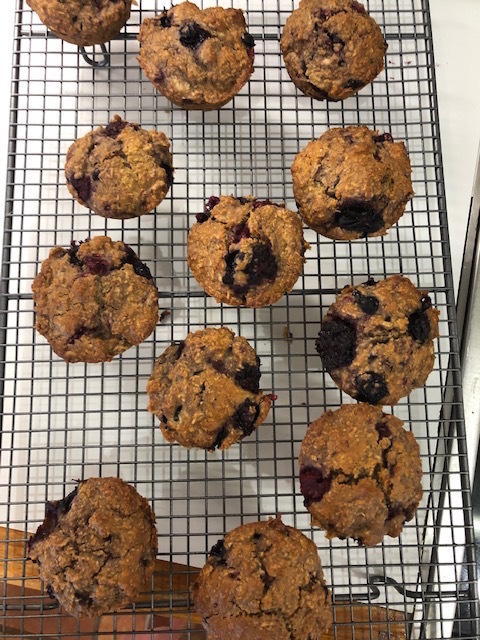 These muffins are not only healthy & delicious, but super easy to make and enjoyed by all family members! Even my husband and father in law like them (I didn’t tell them there was no sugar added!) I also managed to whip them up in about 10-15 minutes with two little toddlers at my feet - their bonus was they got to scrape the bowl! In a medium bowl, stir together the oats, Greek yogurt 6 tablespoons of milk, and vanilla extract. In a separate bowl, whisk together the flour, cinnamon, baking powder, baking soda, and salt. In a third bowl, whisk together the butter, eggss, and honey/maple syrup. Stir in the oat mixture, mixing until no large lumps remain. Alternate between adding the flour mixture and remaining ¾ cup of milk, beginning and ending with the flour mixture, and stirring just until incorporated. (For best results, add the flour mixture in 4 equal parts.) Gently fold in the blueberries. Divide the batter between the prepared muffin cups. Bake at 120 degrees for approximately 20-25 minutes or until the top feels firm to the touch and a toothpick inserted into the center comes out clean. Cool in the pan for 5 minutes before transferring to a wire rack to cool completely.